The Floreat resident (21) has spent the past year creating Down to One, a combat-style game, he premiered at the Perth Games Festival last weekend. ‘Drinking coffee and staying up late at night coding for the game works quite well I must say,’ Mr Blaikie said. ‘After working on it for so long it’s a little bit nerve wracking to show it off. The free event offers game makers a chance to showcase their work to the public and WA’s thriving gaming community. 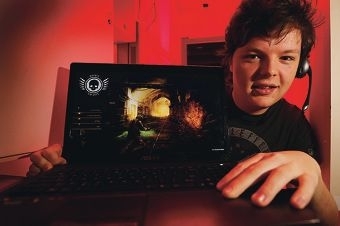 ‘I think there’s lots of really good ideas coming out of Perth and I think Perth has one of the most passionate game development communities in Australia,’ Mr Blaikie said. Festival director Anthony Sweet said the Perth gaming community had a growing reputation. ‘The WA gaming community is recognised around the country, and even internationally, as a really great, healthy scene, and I want people to know this,’ he said, adding that making games is something ‘anyone can do’.